The 13th annual Digital Shootout descended upon the Little Cayman Beach Resort in full-force with 80 underwater photographers from all corners of the globe. 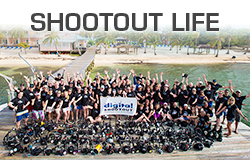 Known as the 'ultimate working vacation', the Digital Shootout is a week-long event, filled with workshops to improve one's underwater imaging skills from the industry's top pros - the perfect combo of awesome Little Cayman diving and world-class instruction. Then, throw in all the latest underwater imaging gear to demo for free, and a friendly photo and video contest at week's end to round out the fun. 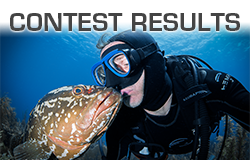 Basically, it's a boot camp with benefits for underwater image-makers, full of camaraderie amongst like-minded underwater photographers. With previous Shootouts held here in 2010 and 2012, it was a comforting and exuberant homecoming to see so many of the same welcoming faces at the resort. Exceeding all of our expectations, Reef Divers took special care of our group's diving needs while managing to show us all the Marine Park has to offer in the shallow reefs and sandy rubble of the Jackson's Bight section to the heart-pounding walls-to-infinity of the Bloody Bay section. The diving in the Bloody Bay and Jackson's Bight Marine Park has always been superb; but this year we noticed even healthier reefs and walls with more sightings and encounters of marine animals, especially groupers and turtles. Considering much of our oceans are on the decline, it is refreshing to see an environment that is thriving. As scuba divers, we are a very small percentage of the total world population, making us very fortunate to be able to witness the pristine beauty of Little Cayman waters. 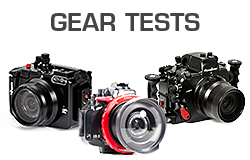 Be sure to check out our GEAR TESTS section, where the Backscatter Underwater Video & Photo staff and manufacturer's reps test all the new gear in everyday, real-life diving scenarios, then report their findings so we, the average consumers, don't have to do the homework! SHOOTOUT LIFE is another not-to-be-missed section that chronicles the comings and goings of the Shootout participants. At times serious and focused (when in the classroom) but always lively and fun, Shootout Life depicts the week from a topside perspective. And lastly, but certainly not least, the CONTEST RESULTS section will showcase this year's winners of our week-ending, friendly competition. Choose one of the following sections to discover more about this year's Digital Shootout.